Seattle attractions... where can I possibly begin? There are so many attractions to see in Seattle that it would be almost impossible to see all of them during a single trip. We've been there so many times and we still find new things to do each time we go back. Plus, there are some things that we just have to do each and every time we're there! Here are some things that we love to do as a family while we're in Seattle and things we think you would love to do with your family. No matter how much or how little time you have, though, you'll still want to set aside some time to see some cool sites and attractions in Seattle. One of the top tourist attractions in Seattle, Pike Place is an awesome place to browse for unique Seattle gifts, or to buy all sorts of fresh fish, fruit, and flowers. It's also the site of the famous fish throwers that you'll definately not want to miss. Every picture you've ever seen of the Seattle skyline seems to include the Seattle Space Needle. And if you're scared of heights (like my wife), there is a ton of stuff to do in the area around the Space Needle, including the Science Museum, the tram, and Rock and Roll Museum. Zoos are always a great place for kids and the Woodland Park Zoo in Seattle has been a favorite place for our kids everytime we're in town. There's a Chinatown in almost every major city in the United States, and while nothing compares to the ones in San Francisco and New York, the Chinatown in Seattle is an interesting place to visit. There are some great places to eat, as well as one of the most interesting Asian specialty stores I've been to called Uwajimaya. While the Seattle Aquarium isn't the biggest aquarium I've ever been to, it's a cool place that the kids love. Do something different! Why settle for a movie or regular dinner when you can experience an early morning or sunset ride on a hot air balloon? 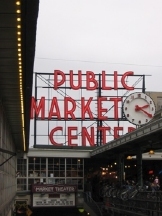 What's your favorite Seattle attraction? 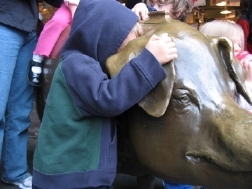 Do you have a favorite Seattle attraction? Share it!